According to www.past-inc.org, the bridge "is an excellent example of the Town lattice truss, with its red-spruce timbers secured by a pair of treenails (slotted and wedged to hold them in place) at every intersection. For many years it was thought that this bridge was built in 1841 to replace one washed away in the flood of 1837, but recent research by Michael R. Gannett for the Cornwall Historical Society has shown that the correct date is 1864. The center pier supporting the middle of the bridge was probably reused from the earlier structure. 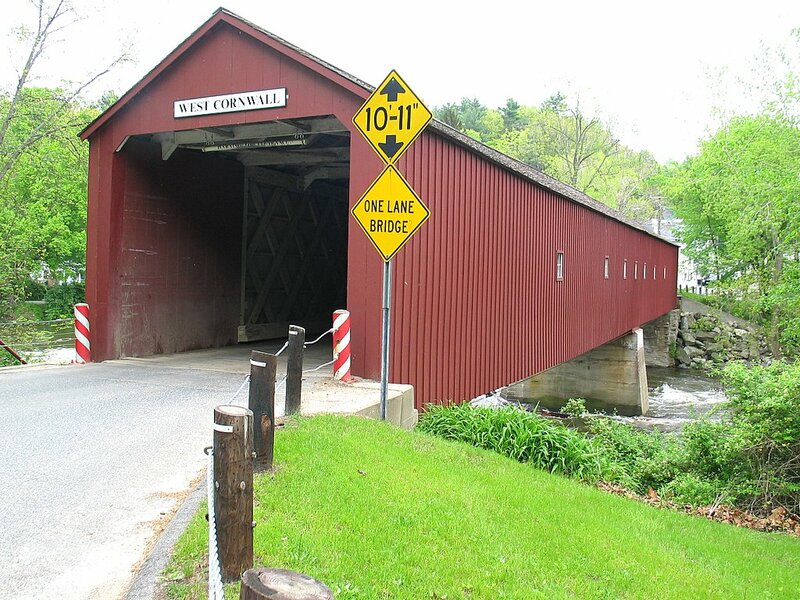 One source gives 1887 as the date when a secondary queen-post truss was added, probably to stiffen the bridge, since wooden trusses had a tendency to sag. " Covered bridges are so cool!! I love these kind of bridges. This reminds me of the bridge the ghost couple drive off of in Beetlejuice. —Hello from San Antonio Daily Photo.